You are here: Home / Nursery Operations / Are branded programs for you? Branding strategies help distinguish products and services in a crowded marketplace. 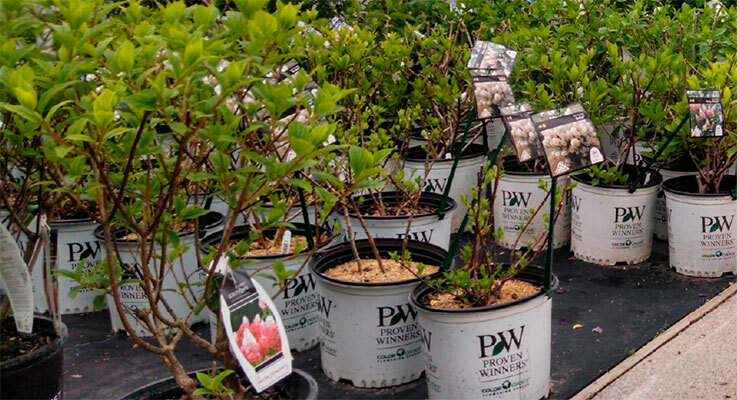 They’ve become a way of marketing life for most industries, and the nursery industry is no different. Plant branding has blossomed as a way to create a particular interaction with the product that customers come to expect and that they return for; it builds customer loyalty and identity with the product. Ketch de Kanter is the owner of Little Prince of Oregon Nursery. His company has grown plants from a branded program and, more recently, has developed its own self-grown brands. Another plus: When a new product is introduced, the brand owner has been trialing it for several years and has the production kinks worked out, ready to pass along that information to growers, Hamill said. So, what do you further need to know to evaluate and discern whether a branding program is for you? Should you develop your own in-house brand or support someone else’s national brand? The first question to ask is, does the brand fit the customer base you already sell to? Does it fit your current product mix? “That’s a big deal when trying to be successful in bringing a brand in,” Nienhuis said. If a grower is planning to take on a branded product that does not currently match the customer base it already serves, there’s more energy to develop services for that area. “If they’re conifer growers, for instance, but the branding is for deciduous trees, they are going to work harder to sell or to find new customers for that brand,” Nienhuis said. If you already carry branded plants, then consider how a new brand would fit in. “Growers grow multiple brands but, strategically, consider which brands fit side by side, each with unique offerings,” Hamill said. It’s an important enough decision that de Kanter recommends you consider doing a focus group before you take on a new brand. Likewise, you need to assess whether selling the branded plants with the requisite marketing materials, such as branded pots and tags, under the license agreement provide the flexibility you need for your business plan. For instance, if you sell only to independent garden stores and a customer does not want the branded product, and you are unable to sell a generic because of the license agreement, it can jeopardize your relationship with your customer, de Kanter said. During the application process, the branding party will determine whether yours would be a unique territory, profiling not only what area of the country you would serve but also your customer base and reputation as a grower. Exclusive territories should be part of the agreement, and it’s important to understand what your territory is. Joining a branding plant program costs more and involves more effort than selling proprietary plants. Taking on a branded plant is an investment, and you should know all the fees to work them into the average costs of the plant and determine whether the cost of the brand warrants the premium for the plant you’re selling. Review the schedule of fees and the fees listed in the contract, which can include membership, distribution, tags, royalties, pots, public relations and marketing. What else? There are more costs than fees to consider; there are resources to devote to the business end of brand promotion. Many, if not most brands have annual grower meetings to keep licensees informed of new introductions, upcoming marketing efforts, growing tips and more. Then there are resources and time for the marketing and reporting to the brand, which may require in-house training and updates of internal human resource and computer systems. For licensed growers of a brand, a major aspect is the consumer advertising. As an acknowledged benefit, the brand promotes the industry and individual plants, driving consumers to buy particular plants, Nienhuis said. But the brand doesn’t do all the work; at the grower level, there are requirements for showcasing and marketing the plant. You’ll need to educate yourself as much as you can about the brand position, the products in the brand, how the products are different from non-branded and other brand offerings, and the marketing made available to you by the licensor. • The restrictions on selling your own products after the contract is over. The contract can live on, de Kanter said. Also, how many types of plants are you required to grow? Does that fit your marketing goals? To take on a brand means not cherry-picking the one or two plants you are interested in, but supporting a complete line. • The length of the contract and the renewal period. Taking on a brand takes time to develop, de Kanter said. Although a brand may already be in the marketplace, it takes several years for a grower to meet the benchmarks and make it work. If the renewal time is too short, it could jeopardize the ability of the grower to make it work. Proven Winners, for instance, has a three-year trial period before issuing a license, Nienhuis said. That timeframe helps determine whether the brand fits a nursery’s way of doing business and whether the nursery has the energy to devote to the new venture. A good relationship and ongoing communication by the growers with the brand managers issuing the license is key to success. “The best way to be successful [in branding programs] is to be involved, be informed and in communication with the brand manager and with other growers who grow the brand,” Hamill said. If taking on a brand seems out of reach, investigate and consider whether you can or want to buy material and grow it without being a licensed grower. This means you have no rights to self-propagate, but also no obligation to pay many of the fees or engage in marketing activities over time. The price of the material has marketing and other costs built in, said Hamill. However, as a non-licensed grower, you may need to buy the branded pots, use the tags, adhere to marketing and display standards and agree to grow high-quality plants. But it’s important to assess where the market is and how you can adequately fulfill your own plans for long-term growth and viability if you plan to take on a brand. And that might also depend on the life cycle of the product, whether it has matured and reached its peak, or is in a declining stage. One final piece of advice from de Kanter: If you’re just starting out, go with a brand that is recognizable, but earlier in the life cycle.